Hello …. good news to all Tesla film enthusiasts, Tesla newbies, Tesla afacionados, and all interested in the story of Tesla’s life, his inventions, his influence in technology, and his importance as the ‘godfather of green’! 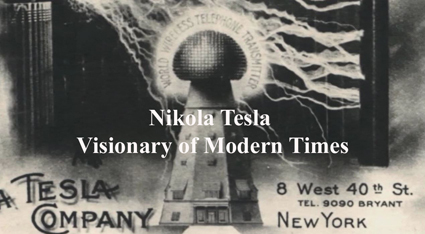 The documentary film “Nikola Tesla – Visionary of Modern Times (52 Minutes) is now available in following territories: Northern Africa, EAU, Iran (via cable/satellite Star Media Services); Estonia, Lithuania, Armenia, Azerbeidjan, Belorus, Georgia, Kazachstan, Kirgizistan (via satellite/cable Red Media Group); Turkey (Pay-TV, VOD MCD); Canada (SRC); Switzerland SRF Swiss TV; Australia, New Zealand, USA, Canada (VOD). If you are a resident in those territories, go have a look and check it out, and you are more than welcome to spread the word!! !